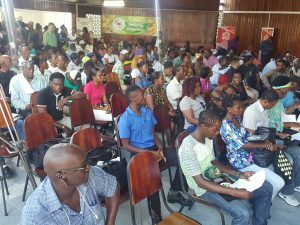 A section of the packed auditorium at the Critchlow Labour College where hundreds of persons attended a business conference that organisers said was aimed at fostering greater business development by Afro-Guyanese. The Ministry of Business’ Small Business Bureau on Wednesday announced that it was offering up to 70 percent guarantee of loans with the expectation that supporting commercial banks would take the risk on the remaining 30 percent. SSB Chief Executive Officer, Lowell Porter explained that at first the guarantee was 40 percent if borrowers fail to repay the banks, but after realising that banks in other Caribbean countries offer 70 and 80 percent guarantees, the Bureau revised its figure to 70 percent. “That’s part of your interest you are losing maybe but you are not losing anything. These are the kinds of conversations that you need to have with your banks,” he said. Porter, meanwhile, said all the monies allocated by government to provide grants of GY$300,000 each have dried up, prompting the Chairman of the International Decade for People of African Descent- Guyana (IDPAD-G), Vincent Alexander to state that the mission of his organisation is to ask government for more funds. 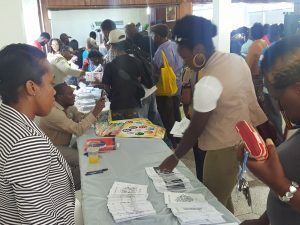 “Unfortunately, the grants have already been exhausted so there are no more grants available,” Porter said, adding that efforts would be found to assist persons who are enthusiastic about their business ideas. “One of our tasks is to work with government to make sure they have more money to give more grants,” remarked Alexander. The SBB provides training, policy review, mentoring and coaching as well as brainstorming business ideas and proposals. Participants collecting information from one of the booths at the Afro-Guyanese business conference. In the area of loans, Porter restated that only two of Guyana’s six commercial banks have said they would support small businesses. “Out of those two banks, only one is a locally owned bank. I personally think that that is ridiculous. If we are thinking about development and maybe the government should make it- I don’t want to say mandatory- but in some ways these banks come in and operate in Guyana, how many are here to support small businesses. We have to push that agenda,” he said. Also of concern to the SBB’s Chief Executive Officer is the fact that one commercial banks do not support businesses that are 0 to 2 years old. “So I said ‘why the hell are you here’ because those are the bulk of our businesses. Those are the clients that we have that are now starting up that need the most support, from 0 to 2 years old, and if you are telling me, as a bank, that you are not interested, then our conversation is ended,” Porter said. The Bureau’s boss urged businesses to insist on knowing what commercial businesses are doing for them. The announcements were made at a conference aimed at stimulating Afro-Guyanese interest in accessing funds and understanding the rules of doing business, but a number of them said they expected more from the event. “I came expecting to hear a bit more about loans and grants, but I did not. They should have allowed us to air our views more than just talking to us,” said one participant who has remigrated from Antigua. Held under the auspices of the International Decade for People of African Descent- Guyana, the event brought together several government and private entities whose representatives interacted with attendees. 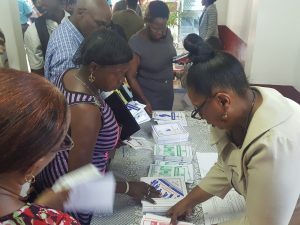 They included the Small Business Bureau, Guyana Revenue Authority, Business Registry, Citizens Bank, Central Housing and Planning Authority, Credit Bureau , Institute of Private Enterprise Development and other entities. After the just over one hour formal opening session, attendees milled around while others left. “Today, you are not going to get loans, you are not going to get grants but today your eyes will be opened,” he said. Addressing the opening session, IPADA-G’s Alexander said Wednesday’s event was merely knowledge-sharing with the ultimate aim of getting loans and grants which have been a major obstacle for Afro-Guyanese businesses. President of the African Business Roundtable, Eric Phillips remarked that economic power was key to political power in the same way that the Portuguese who make up 0.2 percent of Guyana’s population controls 10 percent of the economy and “wield a lot of political power because they have a lot of economic power”. He called on the attendees not to listen to people who tell them they could not succeed because history shows that Blacks have conducted successful businesses including purchasing the first village, Victoria, on the East Coast Demerara. Phillips warned them against being dependent on an the oil economy because volatile oil prices could result in a crisis like in neighbouring oil-rich Venezuela. Instead, the Afro-Guyanese rights advocate said the must cease operating as small individual entrepreneurs but come to together to produce large amounts of agricultural produce to satisfy markets in the Caribbean and elsewhere. “We need to work in clusters. Too many of us are working individually. We can’t do that. Our culture in the village movement is about working in coops, working collectively,” he said. Small business advocate, Patrick Zephyr singled out as a major weakness among Afro-Guyanese, the virtual lack of circulation of monies among themselves. In making out the case for a Black commercial bank, he likened such a financial institution unto a heart. “We need to have our monies circulating in the system and we need to have that heart to pump that money among ourselves,” said Zephyr of the Nile Valley Economic organisation. The Small Business Bureau Act was passed in 2004 and the organisation began operations in 2010, with its first tranche of funds having been disbursed about four years ago. Organisers said Wednesday’s event was organised by the IDPAD-G in keeping with President David Granger’s call for emphasis to be placed on economic and educational advancement in Guyana for the remainder of the decade that ends in 2025.